NEW DELHI: The Supreme Court has directed Tamil Nadu government to ensure that public places, including hilly areas, are not defaced by slogans and advertisements by political parties. A bench comprising Chief Justice Ranjan Gogoi and Justice Deepak Gupta expressed dissatisfaction over the reply filed by the state government in the matter and said it has not acted in a "responsible manner". The bench said, "As the state has failed to act, we direct the state government to ensure that there is no disfigurement of public areas." The court directed authorities to ensure that political parties do not disfigure such public places by pasting photographs of leaders and by writing slogans. Senior advocate V Giri, who appeared for the state government, submitted the PIL petitioner, a charitable trust 'In Defence of Environment and Animals' can approach a committee formed by the Madras High Court and put forth its grievances to it. The SC had earlier too told the TN government that defacement of public places cannot be allowed by political parties with advertisements and slogans. It had asked the state government to inform about the steps taken regarding prevention of defacement of natural resources like hills, mountains, rocks and public places. The SC had issued notice on January 11, to the Centre and the Tamil Nadu government on the plea seeking to restrain political parties from erecting digital banners on roadside across the state. It had asked why the plea should not be kept open, enabling the Madras High Court to monitor the developments in the case. The plea sought preventing encroachments via religious symbols and political graffiti, advertisements by private parties on natural resources like mountains, hills, hillocks, avenue trees and on national and state highways. On December 19, last year, Madras High Court had issued an interim order restraining political parties from putting up digital banners on roadside unless the state government and local bodies came out with a clear undertaking that the rules and various orders passed by the court would be strictly implemented and no violation would take place. 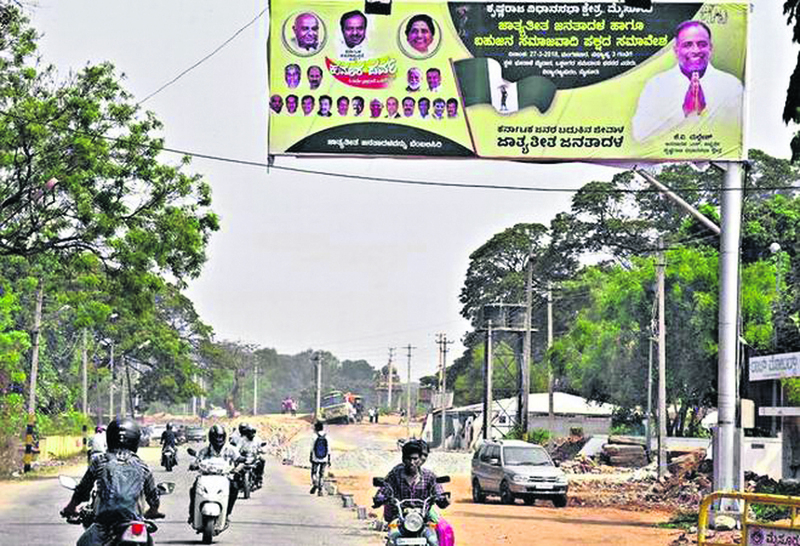 It had said such banners distracted the road users, especially two-wheeler riders, and obstructed pedestrians. The HC had also expressed displeasure over the unjustified reasons given by authorities in the past five years for failing to implement court orders regarding unauthorised banners.